The Hawiye (Somali: Hawiye, Arabic: بنو هوية‎) is a Somali clan. 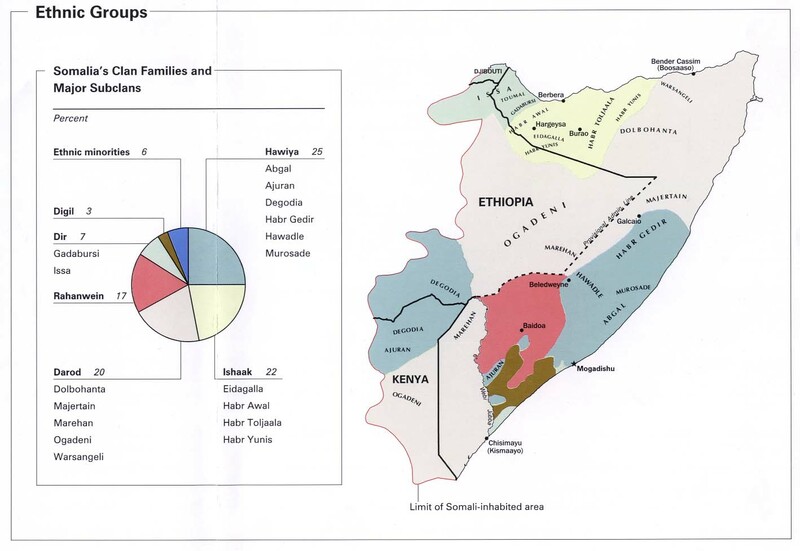 Members of the clan traditionally inhabit central and southern Somalia, Ogaden and the North Eastern Province (currently administered by Ethiopia and Kenya, respectively). Like many Somalis, Hawiye members trace their paternal ancestry to Irir, one of the sons of Samaale. Hawiye is one of the major Somali clans, with a wide traditional territory. It is the dominant clan in Mogadishu, the capital of Somalia. The Hawiye have produced many prominent Somali figures with the first President, Prime Minstier, and the father of the Somali military all hailing from the Hawiye. According to an official military survey conducted during the colonial period, Hawiye clan members are by tradition believed to be descended from a forefather named Hawiya Irrir. He is held to be the brother of Dir. I.M. Lewis and many sources maintain that the Dir together with the Hawiye trace ancestry through Irir, son of Samaale. Traditional territory inhabited by the various Somali clans shown. The Hawiye have historically played an important role in Somalia. Many of Somalia's founding fathers hailed from the Hawiye. The first President of Somalia, Prime minister, and the father of the Somali military were all Hawiye. Aden Adde the first president was Ujejeen. The first prime minister Abdullahi Issa was Habar Gidir. The father of Somali military Daud Abdulle Hirsi was Abgaal. Since then the Hawiye have produced four more presidents and three more prime ministers. The Hawiye's role in Somalia is not limited to only political affairs. They are also prominent in other important fields in Somali society. The clan also has prominent members within the Somali business and media communities. For example, Abdirahman Yabarow, the editor-in-chief of VOA Somali is also kin. Yusuf Garaad Omar who was the chairman of BBC Somali for over a decade and helped pioneer its rise during his tenure is also a member. Magool and Hasan Adan Samatar who are among some of the most famous Somali musicians of all time also hail from this clan. The Hawiye also play an important role in business. For instance the head of the Somali airline company Jubba Airways and Hormud Telecom are also members. Currently the Hawiye play a large role primarily in the Somali regions of Galmudug, Hirshabelle, South West State and Banadir (Mogadishu) but also Somalia as a whole. Hawiye along with some Samaale sub-clans migrated to central and southern Somalia in the 1st century AD to populate the Horn of Africa. They established farmlands in the fertile plain lands of southern Somalia and also established flourishing harbor ports in south and central Somalia. The first written reference to the Hawiye dates back to a 12th-century document by the Arab geographer, Ibn Sa'id, who described Merca at the time as the "capital of Hawiye country". The 12th century cartographer Muhammad al-Idrisi may have referred to the Hawiye as well, as he called Merca the region of the "Hadiye", which Herbert S. Lewis believes is a scribal error for "Hawiye", as do Guilliani, Schleicher and Cerulli. At the end of the 17th century, the Ajuran Empire was on its decline due to high taxation on none-Ajuran clans and the practice of primae noctis which was the prime reason why the Hawiye clan revolted against the Ajuran rulers and ever since this first revolt against the Ajuran other groups would follow in the rebellion which would eventually bring down Ajuran rule of the inter-riverine region. "According to local oral tradition, the Hiraab imamate was a powerful alliance of closely related groups who shared a common lineage under the Gorgaarte clan divisions. It successfully revolted against the Ajuran Empire and established an independent rule for at least two centuries from the seventeen hundreds and onwards. The alliance involved the army leaders and advisors of the Habar Gidir and Duduble, a Fiqhi/Qadi of Sheekhaal, and the Imam was reserved for the Mudulood branch who is believed to have been the first born. Once established, the Imamate ruled the territories from the Shabeelle valley, the Benaadir provinces, the Mareeg areas all the way to the arid lands of Mudug, whilst the ancient port of Hobyo emerged as the commercial center and Mogadishu being its capital for the newly established Hiraab Imamate in the late 17th century. Hobyo served as a prosperous commercial centre for the Imamate. The agricultural centres of Eldher and Harardhere included the production of sorghum and beans, supplementing with herds of camels, cattle, goats and sheep. Livestock, hides and skin, whilst the aromatic woods and raisins were the primary exports as rice, other foodstuffs and clothes were imported. Merchants looking for exotic goods came to Hobyo to buy textiles, precious metals and pearls. The commercial goods harvested along the Shabelle river were brought to Hobyo for trade. Also, the increasing importance and rapid settlement of more southernly cities such as Mogadishu further boosted the prosperity of Hobyo, as more and more ships made their way down the Somali coast and stopped in Hobyo to trade and replenish their supplies. Sheekhaal acknowledges descent from Sheikh Abadir Umar Ar-Rida, also known as Fiqi Umar. Thus the Gaalje'el, Degoodi and Ajuraan are said to have patrilateral ties with the Dir and Hawiye through Samaale to Aqeel Abu Talib, whereas the Sheekhaal traces descent to a different forefather than the Samaale progeny, but also traces to Aqeel Abu Talib. Hizbul Shabaab, the Youth Movement wing of the ICU before ceding the organisation to Aden Hashi Farah "Eyrow"
Islamic Courts Union (ICU), a rival administration to the Transitional Federal Government. ^ Ethnic Groups (Map). Somalia Summary Map. Central Intelligence Agency. 2002. Retrieved 2012-07-30. Perry–Castañeda Library Map Collection - N.B. Various authorities indicate that the Hawiye is the largest Somali clan within Somalia , whereas others suggest that the Darod is among the largest Somali clans . ^ "'Truce' after Somali gun battle". BBC News. 2007-03-23. Retrieved 2007-04-13. ^ Ahmed, Ali Jimale (1995). The Invention of Somalia. Lawrenceville, NJ: The Red Sea Press Inc. p. 124. ISBN 978-0-932415-98-1. ^ Lewis, Ioan. M. (1994). Blood and Bone: The Call of Kinship in Somali Society. Lawrenceville, NJ: The Red Sea Press Inc. p. 104. ISBN 978-0-932415-92-9. ^ Lewis, I.M. (2008). Understanding Somali and Somaliland Society: Culture History and Society. Hurst. p. 4. ISBN 978-1-85065-898-6. ^ Lewis, I. M. (1998-01-01). Saints and Somalis: Popular Islam in a Clan-based Society. The Red Sea Press. p. 99-Chapter 8. ISBN 9781569021033. ^ Ahmed, Ali Jimale (1995-01-01). The Invention of Somalia. The Red Sea Press. p. 246. ISBN 9780932415998. ^ "Somalia Maps - Perry–Castañeda Map Collection - UT Library Online". www.lib.utexas.edu. Retrieved 6 April 2018. ^ Abdullahi, Abdurahman (18 September 2017). Making Sense of Somali History: Volume 1. Adonis and Abbey Publishers. pp. 43–. ISBN 978-1-909112-79-7. ^ Herbert S. Lewis, "The Origins of the Galla and Somali", in The Journal of African History. Cambridge University Press, 1966, pp 27–30. ^ a b c d e f Lee V. Cassanelli (1982). The Shaping of Somali Society: Reconstructing the History of a Pastoral People, 1600 to 1900. University of Pennsylvania Press. ISBN 978-0-8122-7832-3. 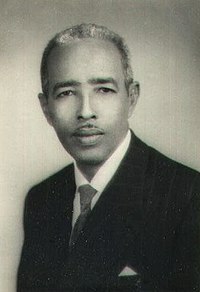 ^ Ali Jimale Ahmed (1995). The Invention of Somalia. Lawrenceville, NJ: Red Sea. p. 123. ISBN 0-932415-98-9. ^ a b Adam, Hussein Mohamed; Ford, Richard (1997-01-01). Mending rips in the sky: options for Somali communities in the 21st century. Red Sea Press. p. 127. ISBN 9781569020739. ^ a b Ahmed, Ali Jimale (1995-01-01). The Invention of Somalia. The Red Sea Press. p. 121. ISBN 9780932415998. ^ Ahmed, Ali Jimale (1995-01-01). The Invention of Somalia. The Red Sea Press. p. 130. ISBN 9780932415998. ^ "CRD Somalia". Center for Research and Dialogue. 2005-07-12. Retrieved 2010-10-12. ^ "Somalia: Islamic Party Insurgents Declare War On New Govt". 8 February 2009. Retrieved 6 April 2018 – via AllAfrica.